My life – most of it – has always revolved around food. My mother’s father was a hotel / restaurant inspector and my father is a hotelier. As a little girl I spent most of my time in the various kitchens of the hotels. I watched as the pastry chef made my sweet patisserie dreams come true, squealed in disgust as the butcher axed the chickens, was intrigued by the way the sous chef magically whipped up the smoothest sauce béarnaise or waited impatiently as the trucks came into the delivery loaded with tropical fruit and vegetables from all over the world. The bustle that probably looked like chaos from the outside worked in fact like a perfectly tuned engine. Each person knew what his or her job was, where to step and most importantly when! The professionalism really fascinated me. There was always a lot of bustle in my grandmother’s kitchen. When we visited my grandparents during our vacations it was always a warm reunion of several family members gathering from different parts of the world in their comfortable colonial Delhi home. Like a moth to the flame I was drawn to the fire of the stoves in the kitchen. There were no fancy gadgets like those in the big shiny hotel kitchens. Instead her kitchen was powered with a mortar and pestle, rolling pins, old sharp knives, cast iron pots and skillets. My grandmother was a phenomenal cook who could whip up a meal for a party with such ease it was almost like alchemy. A pinch of woody coriander, a dash of earthy cumin or peppery turmeric came together with ripe tomatoes, sweet onions and garlic. Succulent chunks of roasted lamb simmered until it melted at the touch of a fork, long grains of perfectly steamed Basmati rice perfumed with cloves and coriander and a touch of saffron – watching her in the kitchen was pure magic. Luckily my mother was an avid learner and once back home, she was able to recreate several of my grandmother’s dishes, with her own special touch. I remember my mother’s incredibly rich vegetable biryani with soft pieces of spiced cauliflower and potatoes cooked on a slow flame until everything is tender and aromatic. Sometimes she added a touch of sweetness with sprinkles of raisins or nutty cashews. 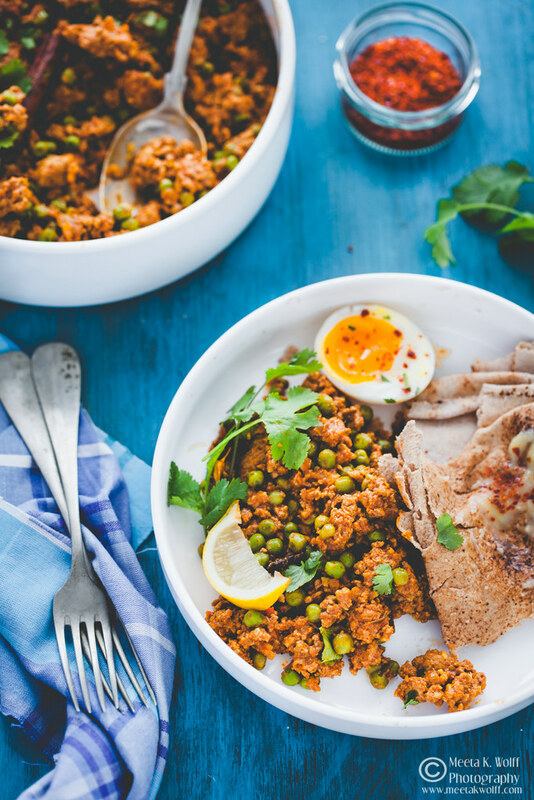 Then there was her wonderful keema – a flavor packed dish made with ground lamb laced with whole and ground spices and sweet green peas. It was a small feast, especially when served with her rich parathas. My dad however loved to scoop up the ground meat with morsels of brown pita bread – a specific kind he buys at a Syrian bakery in Dubai. A few weeks ago my son and husband spent a couple of days in Bavaria on a boy’s trip. I was home alone one evening feeling homesick and craving my mum's meals. Keema craving to be specific. As I started to prepare my own dish I chatted with mum via Skype. "You know mama it never quite tastes the way you or nani made it!" My mum laughed and said "That is because you spice it with your own special memories unique only to either nani or me!" Then she told me to make sure I add fresh tomatoes and not to forget the eggs. "Then think of nani just before you take your first bite!" You know what? 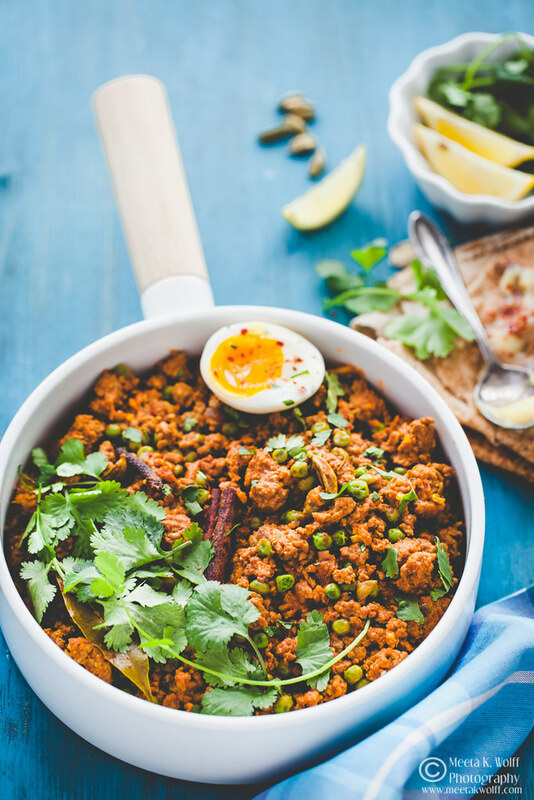 It was the best keema I ever made. My mum always topped her keema with boiled eggs. Like jewels they would sit on top of the browned curried lamb and we would all grab large spoonfuls of the meat with half an egg balancing precariously on the serving spoon. Wrapped in memories of my grandparents and parents each bite was just like I remembered. The best part was I was able to find a similar brown Syrian pita bread that my dad enjoyed. Do you have a favorite dish that you remember your parents or grandparents making? Heat the ghee in a large skillet. Add the whole garam masala spices and as they begin to splutter, add the onions and sauté until brown - this should take about 5 minutes. Add the garlic and ginger and continue to fry for a further few minutes. Add all the spice powders (chilli, coriander, cumin and turmeric) except for the garam masala powder. Incorporate and sauté to approx.. 10 minutes stirring constantly. If the masala begins to stick to the bottom add a few splashes of water to deglaze the pan. Add the tomato puree, fresh tomatoes. Mix well then add the Greek yogurt. Sauté for a few minutes. Lower the heat and simmer for about 5-8 minutes until the oil begins to appear through the masala. Turn up the heat again and the green chilli and the lamb. Mix well, breaking up any lumps with a wooden spoon. Once the meat has browned evenly, add about half a cup of water and allow to simmer for about 20 minutes. Add the peas and finally the garam masala powder and season to taste. Cook for a few minutes until the peas have cooked through. The consistency of the dish should be moist but without any liquid or sauce. 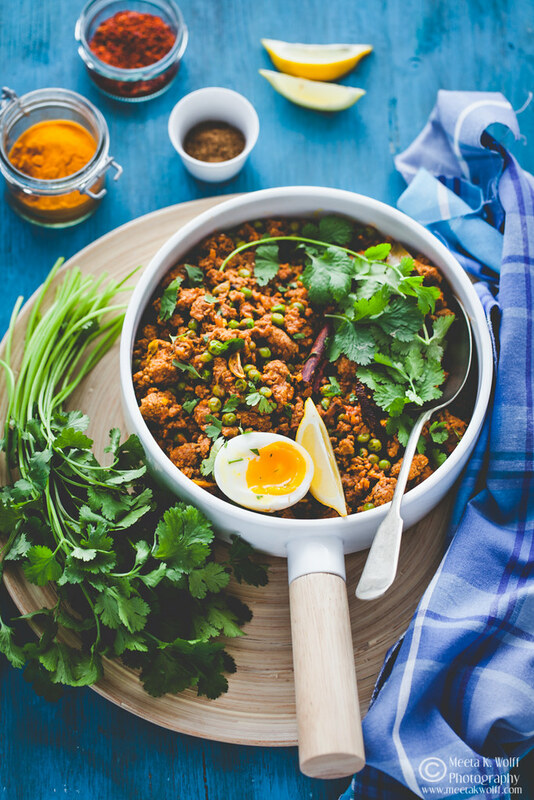 Sprinkle with coriander leaves, cut the hard bowl eggs in half and spread over the meat. 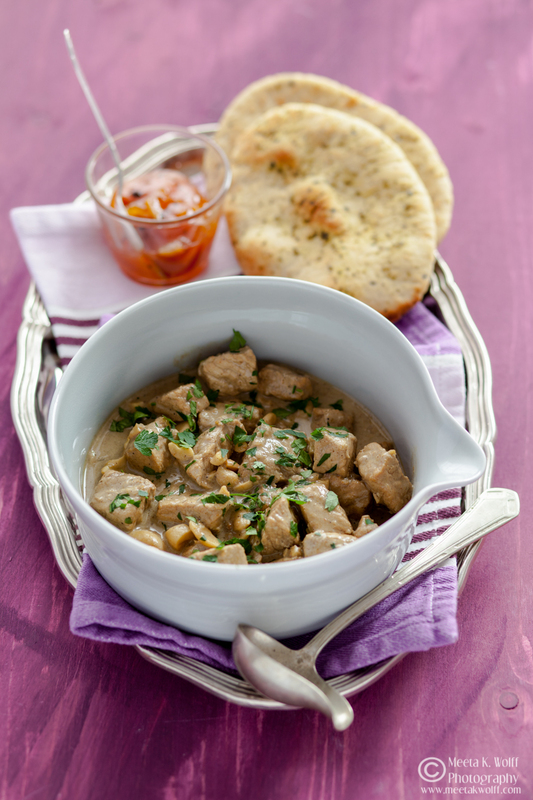 Serve this with pita bread, rotis or parathas. I love warming the pita bread in some wet parchment paper, wrap tightly and nuke it in the microwave for a few seconds. Then spread with some ghee sprinkled with a few chilli flakes. This dish for me has all the flavors of pure umami – that unexplainable flavor that sets not just one taste bud reeling, but seems to get all of them working overtime. 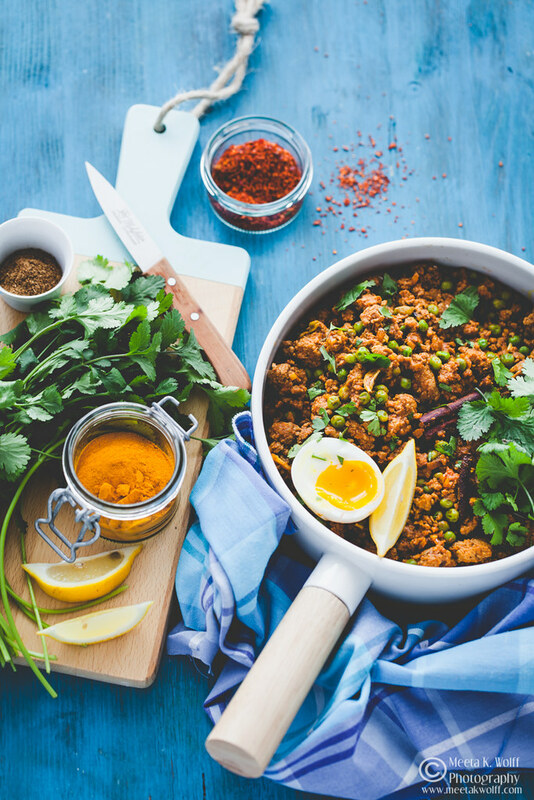 It is as spicy as you want to make it, sweet, savory and aromatic – our Indian answer to the Italian Ragù or the Mexican Chili! The key to this recipe is using the whole spices and roasting them in the ghee to release all the powerful aromas and locking them right at the beginning. Make sure the spices you use are fresh and if you can grind them freshly in a mortar and pestle or a electric grinder. You won’t regret it. In my Spice Infusions series I share a lot of useful details about the Indian spices and how to use them and in my Enspiceopedia - Spices of India I explain how various Indian spices are used. Worth checking out if you are unfamiliar with some of the spices. Power-packed 2-day photography retreat in the stunning rolling hills of Sabina! Currently participants are coming from California, Switzerland and Italy - join us! Meet like-minded people and focus on your passion for food / lifestyle photography in a positive and encouraging environment. I believe in providing a memorable experience - be it the stunning landscapes, the delectable dishes we cook, the knowledgeable tours we take and the incredible insight of the people connected with the workshops. That sounds really tasty! I think my whole family would really enjoy this meal. I love how you grew up! It sounds so exciting and interesting, no wonder your so good in all aspects of food- it's in your DNA! Love this recipe, too. The lamb sounds really delicious prepared this way. Your photos are just beautiful and what a great childhood you must have had, it sounded wonderful! This looks like such a delicious recipe too! This looks so good! I love the colors! I live lamb! This looking delicious! Thanks for sharing! Oh Meeta this post was a pleasure to read! Family recipes, the ones we grew up eating have this magical quality about them, they are like receptacles of memory, a time capsure that transports us back in time. For me, it's my grandmother's Brinjal curry, or my maternal grandmother's Sweet Potato + Coconut balls. It is impossible not to become a child while eating them! Thanks Meeta, for this unexpected journey to the past! I'll be cooking one of their heirloom recipes today! That looks so delicious! 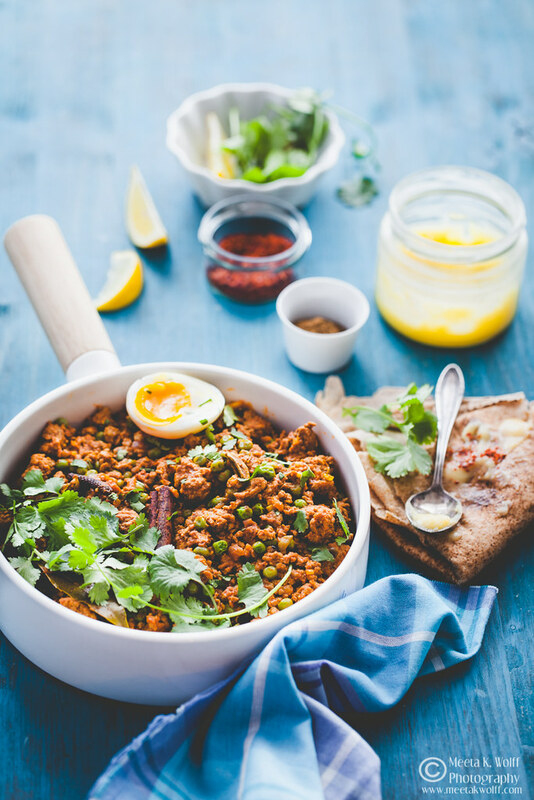 I'm a big fan of ground meat, lamb and spicy food, so you keema is definitely a dish I'd love to try. Mmm...I know I'd love all these flavors. This looks amazing. There was a lot of comfort food that my mom specializes and cooked for us. Different soups with a lot of spices that makes me feel better whenever I am sick and had a sip on it. Beef pho is one of my favorite. This sounds like a tasty dish! I wonder if I can replace the lamb with chicken or fish. If that's possible I would love to try the recipe! Gosh this looks amazing - what a beautiful blend of flavours and textures! Stunning photography too! 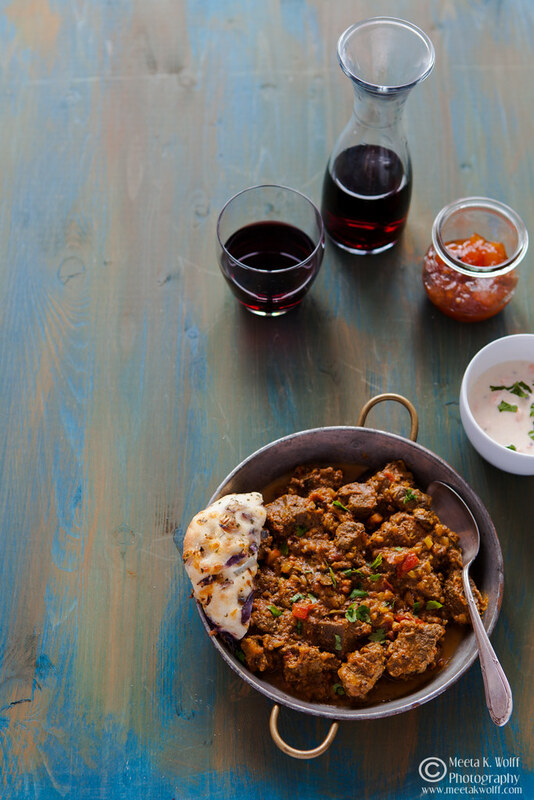 We absolutely adore Indian cuisine, especially when it involves lamb. I really appreciate that you included all of the spices to make whole garam masala as well. interesting recipe! should try this on our anniversary! thanks for posting the recipe and procedure! What a beautiful meal!! I love all the colors, I bet the flavor was amazing too! looks so tasty! im sure my hubby will love this meal too! This looks amazing and healthy. I need to try this, bookmarked. Your lamb and cheese looks delicious. Beautiful photos. This looks delicious and that egg is perfectly cooked! I would love to try something like this! Lamb is one meat that we really don't eat, but my hubby likes it and I really should try it more often. This would a good dish to start with and the children wouldn't have to know what it is. It looks absolutely delicious and I love your photos! Your photos are amazing - I am not sure if this is something anyone in my family would eat but it is surely gorgeous. The photo looks amazing! This dish looks so delicious and mouthwatering. 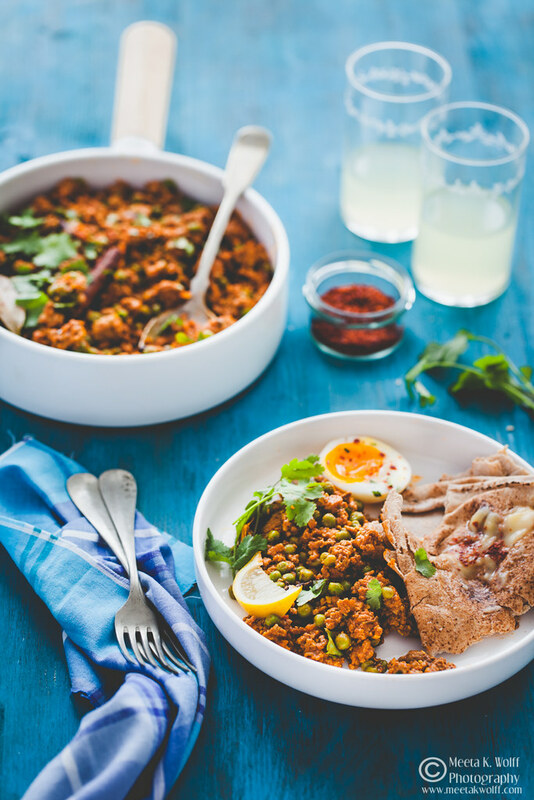 Always love a good spiced food and this one is right up my alley. Might try to cook this since my family love Punjabi/Indian food a lot. Meeta.. your posts are simply awesome. 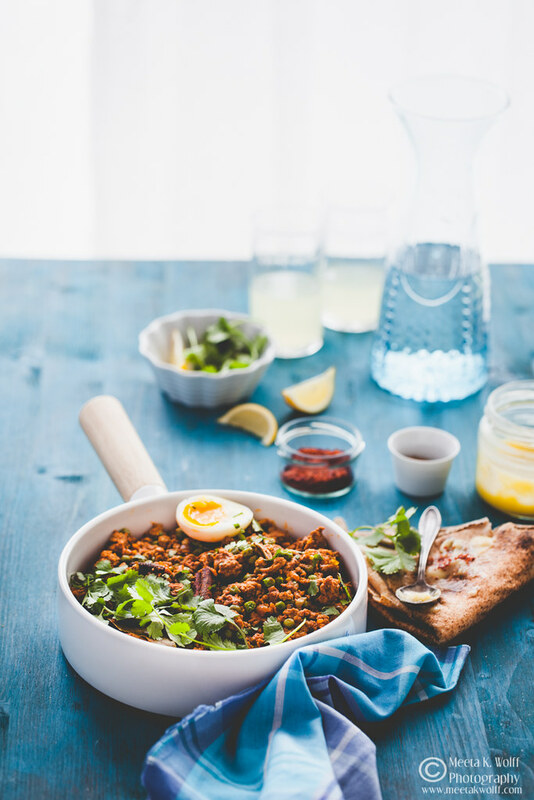 Love the keema matar..
That looks so delicious and great food shots. Looking forward for more articles from you.